Groundwater is the world’s most important source of freshwater. It supplies 2 billion people with drinking water and is used for irrigation of the largest share of the world’s food supply. However, in many regions around the world, groundwater reserves are depleting as the resource is being pumped faster than it is being renewed by rain infiltrating through the soil. Additionally, in many cases, we are still clueless about how long we can keep drawing down these water reserves before groundwater depletion will have devastating impacts on environmental and socio-economic systems. Indeed, these devastating effects are already being observed. The most direct effect of groundwater depletion is the decline in groundwater levels. As a direct impact, groundwater-pumping cost will increase, so too will the cost of well replacement and the cost of deepening wells. One of the indirect consequences of declining water levels is land subsidence, which is the gradual sinking of the surface. In many coastal and delta cities, increased flooding results in damages totaling billions of dollars per year. Next to this, declining groundwater levels lead to a decrease in groundwater discharge to rivers, wetlands, and lakes, resulting in rivers running dry, wetlands that are no longer sustained, and groundwater-dependent ecosystems that are harmed. 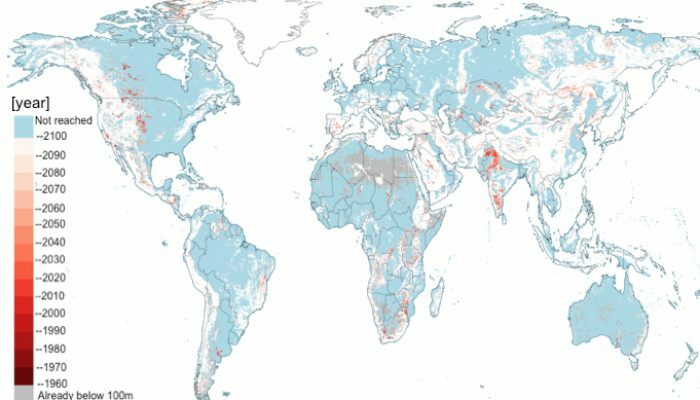 Over the past decades, global groundwater demands have more than doubled. These demands will continue to increase due to population growth and climate change. The increase in demands and the aforementioned negative effects of groundwater depletion raise the urgent question: at what time in future are the limits to global groundwater use reached? This is when and where groundwater levels drop to a level where groundwater becomes unattainable for abstraction, or that groundwater baseflows no longer sustain river discharges. In my PhD research, I predicted where and when we will reach these limits of groundwater consumption worldwide. I defended my dissertation last year April at Utrecht University, in the Netherlands. Where and when are the limits reached? Results show that many large aquifer systems are already highly depleted, especially for intensively irrigated areas in dryer regions of the world, like India, Pakistan, Mid West USA, and Mexico (see Figure 1). New areas experiencing groundwater depletion will develop in the near future, such as Eastern Europe and Africa. Future predictions show that some areas, like the Central Valley, and the High Plains Aquifer, partly recover when more recharge will becomes available. Notwithstanding, environmental groundwater demands will increase as to buffer more irregular streamflow occurrences due to climate change. Figure 1: Estimated groundwater depletion (1960-2010) in [m], masked for aquifer areas, and zooms for hotspot regions, which are the intensively irrigated regions of the world. In 2010, about 20% if the world population lived in groundwater depleted regions, where groundwater dropped below the economical exploitable limit. As a rule of thumb: the economic limit is reached when groundwater becomes unattainable for a local farmer, which is approximately when the water level drops to 100 m below the surface. In 2050, 26% to 36% of the world’s population will live in areas where the economic exploitable limit is reached (see Figure 2). Evidently, this persistence and increasing level of groundwater stress will impair local development and generate tension within the global socio-economic system. Post by WaterUnderground contributor Inge de Graaf. Inge is a postdoc fellow at Colorado School of Mines, in the USA. Figure 2: First time that groundwater falls below the 100m limit. To answer my main question, I studied the effects of groundwater abstractions on river low flows and groundwater levels worldwide, as well as which trends in river low flow frequency and groundwater level change can be attributed to groundwater abstractions. I used a newly developed physically based surface water-groundwater model to simulate i.a. river flows, lateral groundwater flow, and groundwater-surface water interactions at a high resolution (approx. 10×10 km) at the global scale. Total water demands were estimated and account for agricultural, industrial, and domestic demands. I simulated groundwater and surface water abstractions based on the availability of the resource, making the estimate reliable for future projections under climate change and for data-poor regions where we do not know how much groundwater or surface water is abstracted. Next, I developed a global-scale groundwater model. 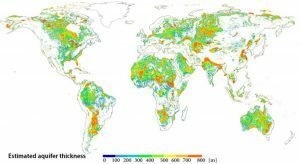 I estimated alluvial aquifer thickness worldwide, as no data at the global scale is available (see Figure 3). Aquifer thickness is one of the parameters you need to estimate groundwater flow and storage. Figure 3: Estimated alluvial aquifer thickness. White areas are mountain regions, where no aquifers are simulated. Simulations were done for the recent past and near future (1960-2050) and the results include maps and trends of groundwater heads, groundwater fluctuations, and river discharges. In conclusion, most of our water reserves are hidden underground and most of our groundwater abstractions rates exceed groundwater renewing rates, leading to depletion. The growing demand and the expected climate change bring our groundwater reserves under mounting pressure. More than two-thirds of all abstracted groundwater is used for food production. Every year the world’s population is growing by 83 million people. Improving our knowledge about how much water we can use in the near future while avoiding negative environmental and socio-economic impacts is therefore extremely important. A study like this contributes to the knowledge gap and can help guide towards sustainable water use worldwide to overcome potential political water conflicts and reduce potential socio-economic friction, as well as to secure future food production. Want to read more? Check out the recent AGU press release or if you have more time… read my papers on dynamic water allocation (click here), development of a global groundwater model (click here, or here), or read my PhD thesis (here).